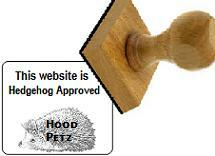 Most questions can be answered on our Policies Page or our Hedgehog Care Page. Before any hedgehog leaves us, the buyer must complete the questionnaire below. Once the form is received, we will contact you with a payment/deposit and pick-up options. How will you handle it if your hedgehog should ever bite or become grumpy? What is the ideal temperature range for African hedgehogs? What kind of insects will you offer and how often? Attention: We have received several forms recently that had incorrect email adresses. Please double check your email address before you submit this form. If your information is incorrect, we will have no way to contact you. If you have contacted us previously and just need to send a quick note, use the form below. All images are COPYRIGHTED MATERIAL and may not be used without expressed written consent. Copyright © HoodPetz.com. All rights reserved.